Can proprietary wireless solutions win against Miracast? This is a costly streaming solution, but it's an impressive product on the performance front and will fulfil some niche scenarios very nicely. Wireless technologies inside and outside the office are now well and truly established, but cables still remain prevalent nonetheless. Take the computer monitor or a presentation display for example – they are still tethered most of the time and while you cannot really pull away from the mains just yet, there are plenty of options around for streaming content from a device to an HDMI-enabled display. Google's Chromecast and Apple's AirPlay are both variants of Miracast, which is itself a take on Wi-Fi Direct, allowing two devices to easily set up an ad-hoc, temporary network to exchange data. Miracast dongles are relatively cheap – you can get one for as little as a tenner but they do come with their own issues including compatibility and overall performance. For those, particularly business users, who require a no-compromise approach, proprietary products like this StarTech HDMI Wireless Extender (ST121WHD2) can provide a solution. Be prepared to part with a small fortune, though. This is not a cheap product – StarTech sells it for a whopping £479 (around $640, AU$845) but you can get it for a lot less; Amazon stocks it for as little as £282 (around $375, AU$500). What this offering promises to do is transmit audio and video signal from an HDMI source to a remote display located up to 50m away; that includes the audio, the video and also the IR signal to control the source device remotely. So unlike Miracast that only works with a device that has a traditional operating system, this one is hardware agnostic, without any software configuration needed. You can use a Blu-ray player and some have reported success with even set-top boxes from the likes of Sky or Virgin Media, which implies support for HDCP (high-bandwidth digital content protection). Sadly, I tried it on Sky's popular Now TV box but it failed to work which means that it won't work for any protected content using the extender as a second screen (e.g. Now TV via a browser or Now TV via a suitable microUSB adaptor). The package – which comes with a two-year warranty – consists of a receiver and a transmitter (both about the size of a pack of cigarettes), an HDMI cable, two power plugs, two IR units, two mounting brackets and a quick start guide. The boxes are identical except for a label which denotes 'transmitter' and 'receiver' on the bottom. They have a reset/power button and lights for video and network status, an HDMI port, plus a mini USB one (to be used for firmware updates only), an IR out and power supply connector. Both devices will need to be connected to the mains – they are mobile but not transportable – and they are small enough to be moved around. Just remember to press the removable plugs hard enough to get them into place. The ST121WHD2 uses 5GHz Wi-Fi, 128-bit encryption to keep your video transmission secure and promises low-level latency (as little as 60ms), making it, on paper, ideal for interactive applications on touchscreens and even video games. Setting it all up was fairly easy although be sure to follow the accompanying instructions. Plug the devices in, and then turn them on, rather than turning them on first. Doing the latter yielded a grey screen saying 'please check video source'. Performance through two brick walls out of sight was good and the handshake between receiver and the transmitter happened quickly. The best performance will always be achieved using cables, but wireless wins when it comes to sheer convenience. Wired comes with compromises: it is relatively expensive, inflexible, doesn't support full HD via HDMI above 15m (extenders will degrade the signal quality) and takes time to put in place, making the ST121WHD2 great for tradeshows and auditoriums as well as digital signage in business environments. Sadly, you cannot stream content from one transmitter to multiple displays by adding one or more receivers. 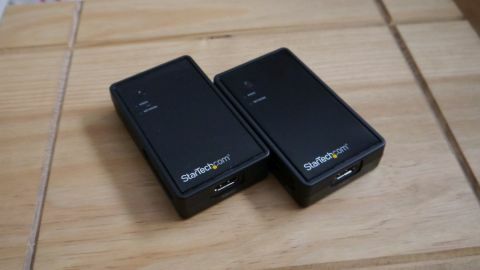 Ultimately, the value of such a solution lies in its ability to fulfil some very niche scenarios and in those cases, the StarTech HDMI over Wireless Extender does the job pretty well.